Originally invented by NASA scientists for space applications, Heat Pipes seem like a simple device that has heat transfer capacities some 1000 times higher than copper and can transfer heat from one point to another without having to use an external power supply. A simple Heat Pipe is a hollow element partially filled with a working fluid and has two sections, an evaporator and a condenser. 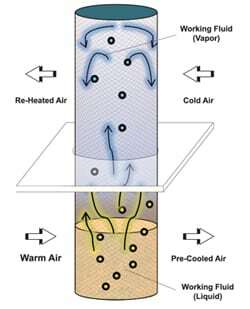 Evaporator absorbs heat and uses it to convert working fluid to vapour, which expands to fill the entire internal space of heat pipe. The condenser is in contact with heat sink and rejects heat leading to the vapour losing the heat and condensing back to liquid. The liquid returns to evaporator and the cycle repeats itself. Heat Pipes have huge heat flux capacity and the speed of heat transfer within heat pipe is comparable to sonic speeds (speed of sound). Being able to transfer huge amounts of heat without using any external power and without any moving parts, Heat Pipes are amazingly efficient and versatile.